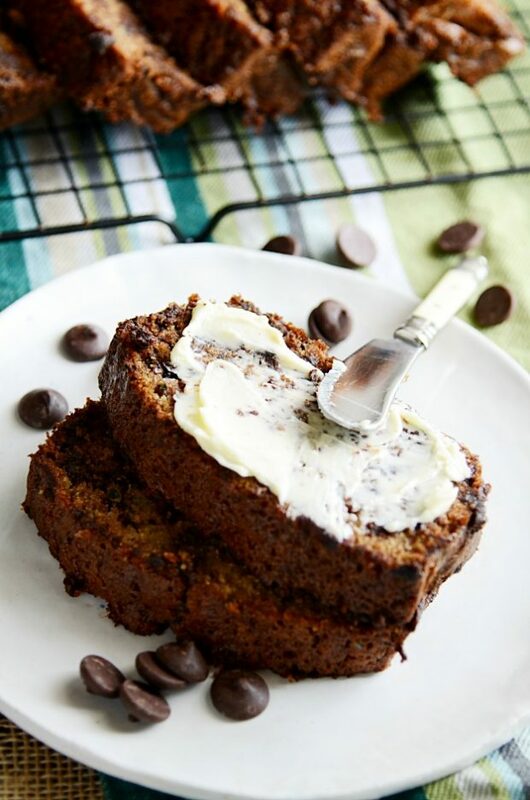 Nothing beats a thick slice of super moist chocolate chip zucchini bread smothered in butter. We DEVOURED this bread. Inhaled it. Like… it didn’t even last two days. It barely stuck around past the 24 hour mark. 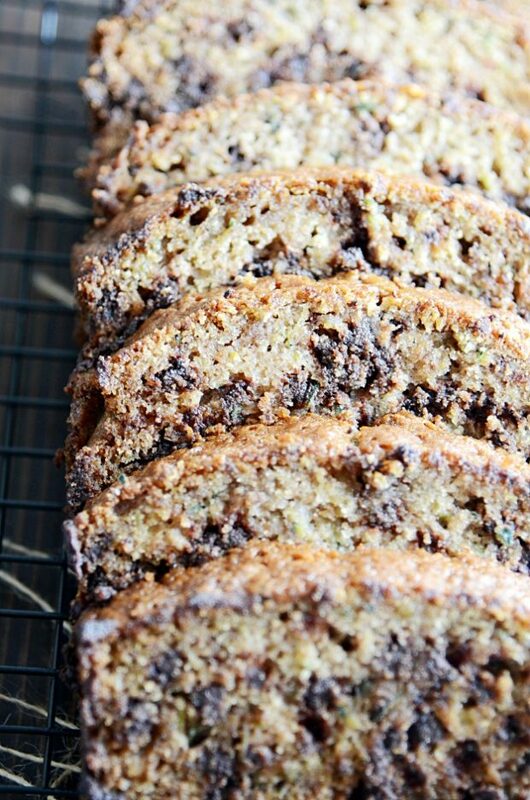 It’s incredibly moist thanks to THREE CUPS of zucchini and the brown sugar. 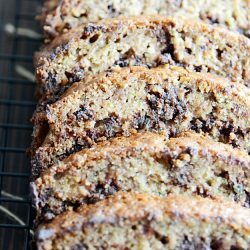 And can you see how shiny the chocolate chips are? That’s my favorite part. 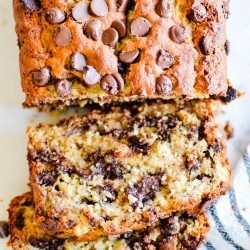 In both banana bread and zucchini bread, I love how the moisture seeps into the chocolate chips creating a little chocolate “bubble” around each chip. I know I’m not doing a great job describing this, but you know what I’m talking about right? I don’t know why, but that just gets me every time. ???? Now, I’m no nutritional expert…. ahem, clearly ??? ?… but I figure all the green veggies here make this bread a pretty square meal. Who’s with me?! 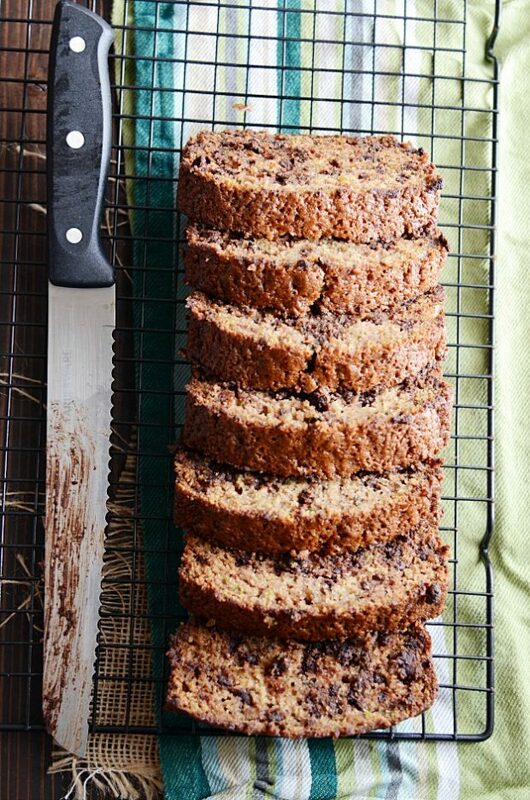 Enjoy a thick slice of this delicious zucchini bread warm or day-old, smothered in butter, with a tall glass of milk. You’ll be in heaven! Preheat oven to 350ºF. Prepare two 9x5 loaf pans with light cooking spray and parchment paper lining. In a large bowl, mix together the zucchini, sugar, oil, vanilla, and eggs. In a separate bowl, mix together the flour, baking soda, baking powder, salt, cinnamon, and nutmeg. Fold the dry ingredients into the wet ingredients just until batter is formed. Divide the batter evenly between the two prepared loaf pans. Bake for about 45 minutes, or until toothpick inserted comes out clean. If needed, cover with foil after 45 minutes to prevent over-browning while continuing to bake. Let cool before removing from pans and slicing. Pin & Print: Blog. Link. Sleep. Repeat. 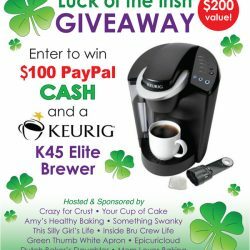 Luck of the Irish Giveaway: Keurig Elite Brewer and $100 PayPal Cash!